Black Friday – Like the Black Pearl, its name evokes cautious fear and spending exhaustion just thinking of it. But unlike it’s fictional counterpart, Black Friday is very real and very exhausting. Fighting the crowds over ‘Deals of the Century!’ and waking at ungodly hours just to stand in line for hours in the cold is what this festive day is all about. It’s hard to think about style when you know what lies ahead and comfort at all levels is something that will NOT be sacrificed. 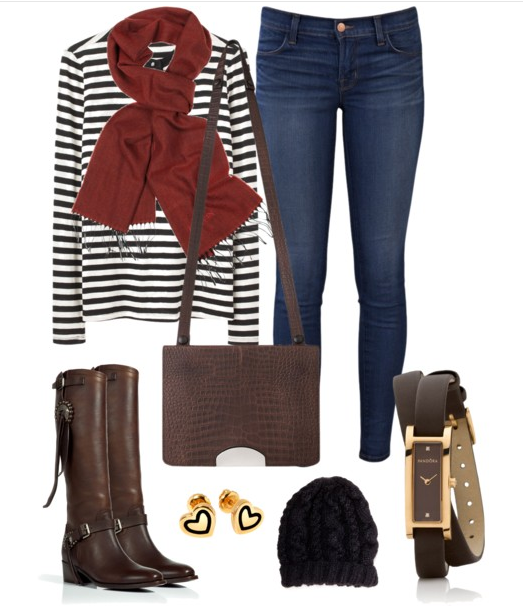 Wanting a warm look with out the bulk we chose a striped henley with a scarf, boots for easy on/off, accessories at a minimum, a beanie to hide static without giving us ‘hat hair’ and of course, a crossbody bag to keep our open arms free. But what’s stylish comfort like you see above actually cost? Well dear kiddies….brace yourself – there aint no Black Friday deals here! The boots, as lovely as they and despite being discounted from $1275 will still set you back a cool $637 thanks to Mr. Ralph Lauren’s skilled stitching. That crossbody bag is gorgeous, as all Maison Martin Margiela bags are, but spend $995 for it? Uh, no thanks. On to our comfy henley – its super stylish, as is that lovely scarf, but when you put Proenza Schouler on and layer with Lanvin, it means adding another $295 and $125 to the total. Those totals leave us chilly rather than comfy cozy. But wait, there’s more! The jeans cost a whopping $396 thanks to the tag that says J-Brand and that killer hair-saver beanie is one of the exclusives from Eugenia Kim’s collection – only $225 if you’re still interested.Last but certainly not least are the sweetly simple accessories! Just when you thought it couldn’t get any more pricey, the earrings will set you back $430 while the watch is just a pretty $605 penny for purchase. The TOTAL COST for this shopping ensemble? Just over $4,300! WHAT THE PHUK. That’s just silly. Thank goodness for the FRUGAL FLIP! With the same look, style and function as the outfit that costs the same as a few months rent, we created a much more finance-friendly option and knocked off a cool $3,950 form that original sky-high total. Ready to learn how to recreate the look at a fraction of the cost? Then Lets Do The DIY Thang, shall we? Ditch the Proenza top and Lanvin scarf for these J. Crew and Finlandia numbers and swap the Ralph Lauren boots for the Wallis version instead. If you dont already have a pair of skinnys and aren’t ready to miss your car note for a pair of the pricy J Brand’s, scoop up the Indressme pair instead and the belt is yours free! Tell good ol’ Eugenia she can keep her beanie since you can get yours at Firetrap and that Maison Martin Margiela Bag will never be used as much as your Fossil Crossbody. Skip the trip to Opening Ceremony for the original accessories – You can find a super cute version of the earrings at Manolo and that wrap watch (believe it or not) is from Target! And there you have it! A Black Friday Frugal Flip that’s high on style and comfort but but still keeps the damage to your pocketbook low. After all, isn’t SAVING what this crazy day is all about? We say go for the gusto and Frugally Flip to your hearts content! No shoving or early wake up call required!